Get ready, all U.S Van Morrison fans, for the rare opportunity to see the living legend live!! For two nights only, the man who brought you “Brown Eyed Girl,” will perform at the Fox Theater Oakland on Friday 20th and Saturday 21st October. Shows like this don’t come around every day – don’t miss your chance! 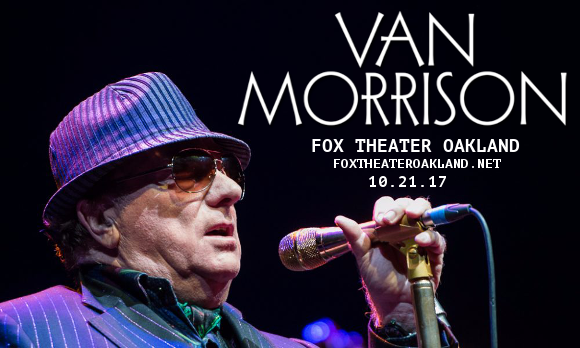 Hit the “Buy Tickets,” button above to see Van Morrison LIVE today!! One of a small handful of musicians to be knighted for his achievements, Van Morrison has received no less than six Grammy awards and is a Rock n’ Roll Hall Of Fame inductee. Undoubtedly one of modern music’s most prolific writers, Van Morrison will be on tour promoting his astonishing 36th studio album, “Keep Me Singing,” due out on September 20th. This release will be his first collection of original material since “Born to Sing: No Plan B,” released in 2012, and is the follow up to his collaborative album “Duets: Re-working the Catalogue,” released 2015. You can’t miss out on the opportunity to see this incredible songwriter of old live onstage – book your tickets to see Van Morrison NOW while they last! !